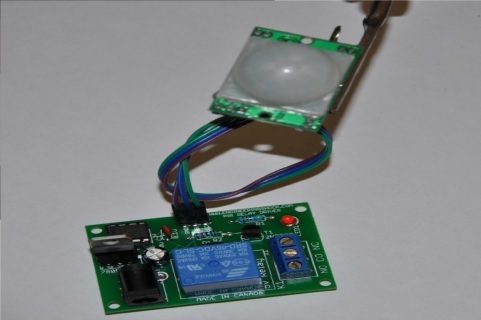 This listing is for a PIR based motion detector DIY electronics kit that can be used to turn on AC devices via an on board relay when motion is detected. PIR (Passive Infrared) sensors pick up on infrared signatures coming off of the human body. The above video offers a full demonstration of how this device works when assembled, and the video below offers step by step assembly instructions. It comes with a DIY control board kit, a PIR motion detector module, a three-wire harness that is used to interface between the control board and the PIR module, and lastly a 9v AC adapter so that you can plug your finished module safely into the wall. We also sell these in fully assembled form for a few dollars more, so check out our store.